Thousands of rockets launched from Gaza raining down throughout Israel. Israeli homes being destroyed by the missiles. Air raid sirens going off giving Israeli civilians less than a minute to find shelter. Millions of Israeli civilians traumatized running for bomb shelters. Sound familiar? The latest conflict is almost an exact replay of what we experienced with the exception of the fact that Hamas today started this round with nearly 10,000 rockets, many Iranian made, with the capability of reaching every square inch of Israel. Earlier this week, the diplomatic blogosphere was abuzz with reports of a cease-fire plan put forth by Egypt and aggressively pushed by the United States. Israel accepted the terms of the cease-fire and suspended attacks on Gaza. But Hamas rejected it and continues to launch missiles. Hamas' rejection should disabuse anyone of the notion that its primary interest is to enhance the lives of Palestinians; rather, its foremost goal is to destroy the nation to its east and murder all of its inhabitants. The safety and well-being of Palestinians living in Gaza is the furthest thing from the mind of its bankrupt leadership. But the rules are different for Israel. Rather than allowing Israel to finish the job and protect its citizens from a terrorist-controlled government on its border bent on its destruction, the Obama administration forced Israel on Nov. 22, 2012 to agree to a hastily-negotiated cease-fire unofficially accepted by Hamas and Islamic Jihad. The similarities between November 2012 and July 2014 are uncanny. Then, as now, Hamas deliberately hid its rockets, missiles, bomb factories and terrorist headquarters in civilian areas, hospitals, mosques, kindergartens, and schools, effectively forcing all civilians living in those institutions to become involuntary human shields. As life would repeat itself, the impetus for the cease-fire was two-fold: Europe's one-sided obsession with Israeli actions taken to defend itself at the same time it selectively ignores vast human rights violations elsewhere in the world, with some amounting to genocide, committed by China, Cuba, Saudi Arabia, the United Arab Emirates, Syria and Turkey, to name a few at random. The second factor is the manifestly dishonest and selective one-sided biased media coverage from Gaza of Israeli strikes without hardly any context explaining why Israel was launching the strikes. Even worse, were the reports by journalists in Gaza claiming that Israel was indiscriminately bombing Palestinian civilians by uncritically citing Palestinian propaganda reports that there were no Hamas terrorists or bomb factories under or near the targets. This past weekend, reports from CNN's Ben Wedeman's were barely indistinguishable from Hamas television when he broadcasted from bombed-out buildings in Gaza zeroing in on young children. What Wedeman did not show were the underground bunkers housing Hamas rockets beneath the bombed-out buildings. The devils are always in the details. In 2012, Israel acquiesced to pressure from the Obama administration to sign the cease-fire agreement, which was not worth the paper it was written on. Yet not worthless for all: For some, the November 2012 "cease-fire" agreement was like manna from heaven. It conferred legitimacy on Muslim Brotherhood Egyptian President Morsi, a dictatorial Islamist thug who was already imposing authoritarian fiats concentrating all power in his hands while freeing from prison hundreds of Hamas and Muslim Brotherhood terrorists. It also elevated Hamas and Islamic Jihad, two murderous terrorist groups, to the level of diplomatic respectability equal to that of Israel. And it wrangled from Israel a huge concession that Israel had succeeded in imposing on Gaza to insure that Hamas was not using to build bomb, rockets and tunnels for attacks on Israel: Ever since Hamas—a terrorist group openly seeking the destruction of Israel—had taken over Gaza in 2007, Israel imposed a strictly regulated regimen of what could and could not be imported into Gaza. The purpose was to keep bomb-making material out of Hamas' hands. That included a ban on large quantities of steel, cement and ammonium nitrate, the primary ingredients that Hamas had used to build tunnels to smuggle weapons, underground bunkers to store rockets to fire at Israel, and to manufacture bombs and explosives to be used in attacks on Israeli civilians. In inducing the prime minister to sign the vague November 2012 "cease fire" declaration, the president called Benjamin Netanyahu and provided separate assurances that the United States "would use the opportunity offered by a ceasefire to intensify efforts to help Israel address its security needs, especially the issue of the smuggling of weapons and explosives into Gaza." But if you make deals with terrorists, don't expect them to uphold their part of the bargain. In the very hour after the cease-fire was declared, 12 rockets were launched from Gaza into Israel. Two days later, according to U.S. intelligence officials, American satellites photographed a convoy of more than a dozen flatbed trucks entering Gaza from Rafah (Gaza's border with Egypt), each with Iranian-made Fajr missiles. More ominously, in the next 18 months, according to Israeli and American intelligence, thousands of missiles from or through Iran, Sudan, Syria and Hizballah were smuggled into Gaza, including the long range M-302, M-75 and the Grad capable of hitting nearly 90 percent of the entire Israeli population. During the same time period, Hamas built hundreds of tunnels, some large enough to fit armored personnel carriers, to smuggle weapons or kidnap Israeli soldiers as it did with Gilad Shalit. Hamas also followed the Hizballah model by building extensive labyrinths of underground tunnels and bunkers to store and fire rockets without being detected by overhead Israeli surveillance flights or satellites. All told, by June 2014, according to Israeli intelligence, Hamas, Islamic Jihad and other Gaza-based terrorist groups had amassed more than 10,000 missiles. The November 2012 agreement with the accompanying pledge by President Obama to prevent Hamas from acquiring new missiles meant absolutely nothing, (a fact not lost on Israel, which has been asked by President Obama to rely on American promises to keep the West Bank secure under an Israeli withdrawal which the U.S. is vigorously promoting). That is why Hamas now is able to fire its long range missiles into Israel from underground bunkers, ironically built with the tons of steel and cement that the United States pressed Israel into being allowed into Gaza. What happened to President Obama's promises to Israel, as part of the November 2012 cease-fire agreement, to stop the flow of missiles to Gaza? In two words: Absolutely nothing. Instead of building defensive lines around Gaza like moats, or driving pylons deep into the earth to create an impregnable barrier, the Obama administration focused its efforts on getting Israel to lift its blockade on steel and concrete, the two major building components of underground tunnels and storage facilities for munitions, on "humanitarian grounds." Despite the administration's much ballyhooed November 2012 "cease-fire" agreement that the Obama White House prided itself in bringing an end to the Israeli-Hamas war, somehow Hamas never got the message: From December 2012 to July 1, 2014, Hamas fired nearly 600 missiles into Israel. Ever since the current round of fighting started, the Obama administration has stated that it backs Israel's right to defend itself but it always adds a qualifier. At nearly every press conference since the fighting started, Obama spokespeople have undercut their proclaimed support for Israel by robotically asserting that Israel "needs to not escalate the situation." I have been trying to figure out what that phrase means. Imagine what our reaction would have been after the 9-11 attacks if our allies warned us "not to escalate the situation." Let's be honest here: The caveat issued to Israel by the Obama administration to "not escalate the situation" is evidence of the administration's selective policy towards terrorism, especially when it comes to our good friend Israel. It means that while the United States has free reign to go around the world to wipe out al-Qaida, Israel is forced to live with its version of al-Qaida—Hamas. According to U.S. officials, if only Israel would cede back all of the territories it conquered in the 1967 war and allow the creation of a Palestinian state, the incentive for Hamas terrorism would dissipate: So goes the conventional wisdom of American leaders like Bill Clinton, George W. Bush, and Barack Obama, as well as their Middle East negotiators like Martin Indyk, Dennis Ross, Aaron David Miller, Robert Malley, and former U.S. Sen. George Mitchell. But overlooked is the fact that the Palestinians twice rejected Israeli peace deals offering 99 percent of all territory conquered in 1967. And, even if Israel were to offer Tel Aviv, Hamas has a covenant that demands for all-out war against the Jews and prohibits any peaceful settlements with whom they call the "killers of the prophets." Indeed, as the French saying goes, the more things change, the more they stay the same. If there was any one factor that led to the current war initiated by Hamas against Israel, it was the vacuous November 2012 "cease-fire" agreement that the United States pressured Israel to sign, and which forced Israel to break its blockade on Hamas that was imposed on the terrorist group's acquisition of the materials it needed to construct tunnels and underground bunkers. The roots of the current conflict were further contained in the categorical failure by President Obama to deliver on his promise to Israel to provide technology and other assistance to halt the murderous arms smuggling by Hamas. Yet given the spectacular failure of the November 2012 "cease-fire" that was the ultimate cause of the current war, White House Press Secretary Josh Earnest on Monday, July 14, 2014 actually referred to and praised the November 2012 agreement as the model agreement which he said the administration would like emulated right now. "Well, we certainly would like to see a cease-fire along the lines of the cease-fire that both sides agreed to and was facilitated by the United States about a year and a half ago," Earnest said, "that that certainly is the kind of agreement that we would like to see in that area that would restore some -- at least some measure of peace in the area." Israeli political officials with whom I spoke realize the November 2012 agreement is officially dead and buried. They are not going to enter into a new agreement that allows Hamas to reconstitute itself and fight a day of its choosing in the future. At the same time, they realize there are no easy answers. Israel military sources say that with an average of anywhere from 100 to 150 missile strikes daily from Gaza, it will take weeks, if not months, for Hamas to exhaust its supply of projectiles. Pinpointed Israeli raids can only take out what they can see or those sites known by intelligence to contain hidden missiles or explosives or serve as safe houses of the actual terrorist masterminds. Having been bloodied and battered, Hamas has not been exactly quiet about its desire for a cease-fire, but only on its own terms. In the history of international conflicts, terrorist groups that lose don't get to dictate the terms of the end of their conflict. But in observing the pressure being put on Israel, Hamas figures all it has to do is wait until Israel is forced to succumb. This time around, the Israel Defense Forces say they are ready to initiate a ground offensive in Gaza to finish the job they started in November 2012. That means finding and destroying the underground bunkers and tunnels where the terrorists and the rockets are located. Israel knows that ground missions are notoriously dangerous with the potential for high numbers of casualties on both sides, escalating exponentially. But until the world teaches Hamas it has lost the war, instead of being rescued by its friends at the United Nations and in the media, Israel knows it will have to go it alone. Thank you for telling it like it is--It absolutely ridiculous to assume that any other country in the world would not protect itself if attacked (i.e. 100-150 missile strikes per day). If it were not for the iron dome the Israeli casualties would not doubt be catastrophic. I also opine that until the general masses reject groups like HAMAS, peace will be impossible. Extremism is the enemy of all peoples in the Middle East and elsewhere. I also believe however that the credibility of HAMAS is waning and disappearing all together. Let's hope that this a trend that catches fire. Deja Vu, again and again. 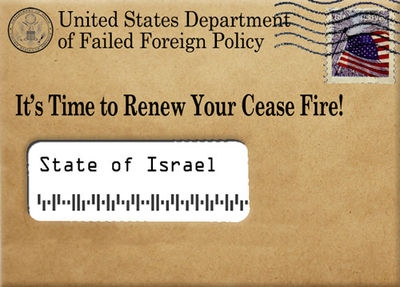 It's true, the U.S. has started its "cease fire" soft shoe routine again, just like in 2012. And just like in every single battle, skirmish and war Israel's had to fight since 1967. Unfortunately, every time we, the U.S., have pressured Israel to settle for a cease fire, we've also prevented her from delivering to the enemy the coup de grace that ensures those Jew haters will think a lot harder before coming after Israel again. Israel wins on the battle field, but U.S. meddling always turns those military victories into defeats on the diplomatic front, with Israel being forced to help her enemies live to fight her another day. This has got to stop. Thankfully, it seems as if Netanyahu is finally ready to call the shots as he sees them; not as the U.S. wants them.